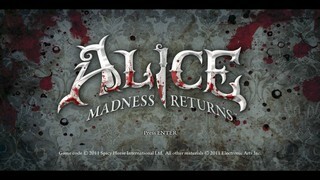 Alice: Madness Returns is the 2011 sequel to American McGee's Alice, loosely adapting the characters of Alice in Wonderland in a strange mixture of repetitive 3D platforming, psychological horror and themes of child prostitution and murder. Best New Game+ time with deaths: Single-segment 1:44:17 by 'zawj' on 2013-08-31. First of all I'd like to thank everyone involved in speedrunning this game: Aimsh, DancingScarecrow, devilsrose, dokalfar, frazse, fukyichung, g0fr3t, TheVoid, z1mb0bw4y - You've all done a great job by finding all the huge skips, small skips, glitches or even just supporting me in the chat. I'd also like to thank everyone behind SDA for putting a lot of effort to keep this place so awesome. The run was made on PC (Steam) version of the game. As it's a quite sloppily made console port, the only differences between versions is support for different resolutions, mouse and keyboard controls and maybe loading times. PC version even inherits the limit of how big area part can be loaded at once, what is abused a few times in the run. The random slowdowns and frame drops are the game's fault. Recording and encoding software have nothing to do with them, they're gonna happen no matter what, sometimes in certain places, sometimes randomly. Same goes for many other glitches. Saying that I've seen a new glitch every time I attempted a run isn't exaggerating. The run was done on nightmare difficulty, new game + mode with royal dress equipped. New game + allows me to start with all weapon upgrades and dresses along with their special powers. Royal dress limits my HP to 4 points total. Many enemies on nightmare deal 3 HP of damage. Having 1 HP or less allows me to enter hysteria mode that gives me invincibility, more attack power and unlimited ammo. Dashing: used constantly is pretty much the fastest way of moving in a straight line on ground. Shrinking is used to cancel a dash (and many more animations) and allow a free change of direction ("corner shrinking"). For mid-air movement dashing is not always the best solution, especially after slides - it can kill all the speed in this case. Same goes for floating, except before doing it the glitched extra jump, where the speed is restored after the jump. Glitched extra jump: game typically allows only 3 extra jumps with 4 seconds float after each. By releasing the jump key and pressing it immediately during the final float it's possible to do another, glitched jump. It's not as high and does not allow a float afterwards. It's one of the most important glitches in the whole game, the base of many sequence breaks. Rapid teapot fire: done by alternating weapons between each shot, reduces delay significantly. Deadly when combined with hysteria. Hysteria lag cancel: by using another weapon immediately after activating hysteria it's possible to cancel the initial slowdown and the shockwave. Standing still is the best way to do it, as most other animations (being knocked down, attacking) have priority over hysteria initial animation. Edge jump: it's possible to do a normal, high jump from an edge of a slide. Doing one from a longer edge usually keeps the speed as well. Death barrier abuse: one can get teleported further by simply dying in a certain place (usually after out of bounds skips). Sometimes it's also needed to touch a trigger before (e.g. theatre skip). Wall jumping: can be done only in certain corners, types of hitboxes or in places where whole areas load and unload (see render distance abuse). Render distance abuse: by looking at a certain direction in certain places one can make a whole area (along with walls' hitboxes) appear or disappear later or sooner. Used in locker, executioner and 666 skips. That's all. Hope you enjoyed the run!